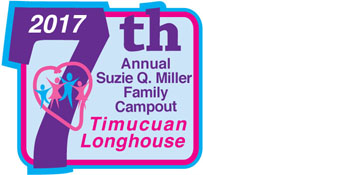 The Timucuan Longhouse would like to invite all tribes and members (and also moms!) to the 2017 SQM Family Campout, which will be held January 27-29, 2017 again at the Ocala Wildlife Conservation campground. The campground, adjacent to Ocala National Forest, is about a 45 minute drive southwest from St. Johns County to south of Palatka near the west bank of St. Johns River. The venue is outstanding having campsites but also some cabins, bunkhouses, and terrific facilities including the Gazebo and Great Hall. The restrooms and showers have been modernized. Last year, at Ocala, we were fortunate to enjoy excellent camping weather during Florida wintertime. Planned events are expected to include archery and bb-guns at the range and some time on the lake in canoes. There should also be a critter race, spirited tugs-of-war, and zip lining. Once again, the highlight of the campout will be The Fed Feast dinner Saturday evening. Last year, we enjoyed some outrageously good BBQ including ribs, brisket, pork loin, and more. After the Feast, we plan to enjoy an amazing pyrotechnics show. Later, a dance will be held in the Great Hall. See Big Tree or Big Bobcat at the campout to purchase raffle tickets and see the rifle. Firearm will be transferred through FFL after the raffle. • Safety: Rebounding firing pin automatically blocked to prevent accidental discharge. • Barrel Length: 16 1/8 inches. • All Crickett rifles are held together by “1” take down screw that is located on the underside of the stock near the trigger guard. This is the only screw that hold the stock onto the barreled action. If you notice a hole near the forend of the stock, please see note below.